Thanks to great beers like Celebration, Pale Ale, the Harvest series, and now Torpedo, the name Sierra Nevada is deeply associated with hops in my mind. But, Sierra Nevada also brews up a couple of beers from the maltier side of the style spectrum, both a Porter and a Stout. With as much as I have enjoyed the hoppy beers I've tried from Chico so far, I decided it was time to check out some of the darker Sierras. 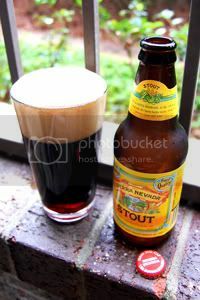 "Creamy, malty, and full-bodied, the Sierra Nevada Stout is satisfyingly rich. Caramel and Black malts give the Stout its deep, dark color and pronounced roasted flavor." It certainly sounds like a solid Stout, but let's crack the bottle to be sure. Appearance: A dark, imposing body that only allows a handful of dull ruby light to pass through. A big, sticky, toffee-colored head endures until the bottom of the glass, leaving terrific lacing on the way. Aroma: As you'd expect, lots of roasted malt with the usual chocolate and freshly ground coffee notes associated with a good stout. Hops make an appearance, unlike most Stouts. Taste: As you'd expect in a Stout, the backbone is of sweet, roasty malt. Despite being a plain old American Stout, this puts many Chocolate Stouts to shame in the chocolate department. It's almost like a frothy chocolate malt at times. Somewhat bitter hops are more present than your average Stout, but never really raise their voices all that much. As I've come to expect from Sierra Nevada, this is a well balanced beer. Mouthfeel: Beautifully creamy medium-full body with moderately-high carbonation. Drinkability: Average for the Stout style. You're probably not going to be chugging these after you mow the lawn, but you won't have to nurse it for hours on end. Verdict: Maybe it's because I associate Sierra Nevada mainly with the hoppier styles of beer rather than the malty ones, but I was expecting this to be a solid, but generally unexciting Stout. Boy, was I wrong. This is a chocolaty, complex beer very much worth a look.